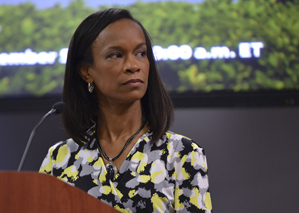 After three consecutive months of the economy adding more than 25,000 jobs, the Black unemployment rate could dip below 10 percent by mid-2015 if current trends continue, says Valerie Wilson, an economist and director of the Program on Race, Ethnicity, and the Economy (PREE) at Economic Policy Institute. When Wilson analyzed the labor force participate rate, which includes people that currently hold jobs or are looking for work and the employment-population ratio for all workers, she found that Blacks had the biggest increase in both measures from December 2013 to December 2014. “If the same trends in the labor force participation rate and the decline in the unemployment rate that we saw in 2014 continue into 2015, the Black unemployment rate should get down to the single digits by the middle of this year,” said Wilson. The Black unemployment rate decreased from 11 percent in November to 10.4 percent in December, and the jobless rate for White workers ticked down 0.1 percent to 4.8 percent in December, according to the latest jobs report by the Labor Department. The unemployment rate for Black men over 20 years old ticked down from 11.2 percent to 11 percent in December while the unemployment rate for White men fell from 4.6 to 4.4 percent over that period. The unemployment rate for Black women over 20 years-old slid from 9.5 percent in November to 8.2 percent in December and White women saw their unemployment rate inch down from 4.5 percent to 4.4 percent during the same period. The Labor Department also revised the number of jobs added in October (261,000) and November (353,000), accounting for an increase of 50,000 jobs. American workers found jobs in professional and business services, construction, food services and drinking places, health care, and manufacturing in December. Wilson said that December’s jobs report signals that the prospect of economic recovery in the Black community is pretty strong. Bernard Anderson, a nationally-recognized economist and professor emeritus at the Wharton business school at the University of Pennsylvania in Philadelphia, agreed. “Despite the fact that Black people have a higher rate of unemployment and lower income, they remain far more committed to the labor market than White workers on average,” said Anderson. Anderson said that employment is growing more rapidly now than at any time since the recovery began in 2009. Gross domestic product (GDP) grew 5 percent in the third quarter of 2014, yet wages have not increased significantly. “We have an anomalous situation in the labor market where employment is beginning to rise, but earnings are still relatively flat,” explained Anderson. In fact, average hourly earnings for all employees shed a nickel in December. Anderson observed that wages increased more rapidly during previous recoveries as the unemployment rate fell. Lawrence Mishel, the president of the Economic Policy Institute, wrote in a blog post at EPI.org that stagnant wages hurt more than the workers at bottom. Anderson said that when the labor market tightens the unemployment rate comes down, and employers are forced to compete with each other for available labor. That competition often leads to increased wages. Unionization also plays a critical role in raising the wages of low- and middle-income earners. Mishel said that unionization leads to higher wages without harming economic efficiency. “Collective bargaining also leads to a larger share of corporate income going to wages rather than profits; the fact that corporate profits are at historic highs is a reflection, in part, of the current weakness of collective bargaining and the heightened power of corporate owners and managers,” Mishel wrote at EPI.org. Even though overall union membership has fallen to record lows, according to a 2012 report on unionization by the Labor Center at the University of California at Berkeley, Black workers were union members at higher rates than non-Black workers in the United States. Wilson said that if workers don’t feel empowered on the job, it’s difficult to go in to negotiate and demand the pay that they deserve.